Andreas Tziolas is drafting a blueprint for a mission to a nearby star. Here, he discusses how we’ll get there — and why we try. We humans have known for a very long time that going to the stars will be difficult, if not impossible. The motto of NASA, Per Aspera Ad Astra, a latin phrase meaning “through hardship to the stars,” comes down to us all the way from Seneca the Younger, a contemporary of Nero. Even today, when our metaphors of exertion and ambition are many –“swing for the fences,” “go for gold” — when we strain to capture the difficulty of a task, or the enormity of an achievement, “reach for the stars” is the first and most natural phrase that comes to mind. Our hierarchy of the ultimate human accomplishments is in this sense remarkably stable at the top. And with good reason, because interstellar travel is in fact very difficult. With today’s best propulsion technology, chemical rockets, it would take between 50 and a 100 millennia to reach Proxima Centauri, the nearest star to the Sun. The ideas we have about how to expedite such a journey are just that: ideas. They belong to the realm of speculation. Nonetheless, they are beginning to take on an empirical glow. To be sure, the bundle of technologies that could conceivably send a spacecraft to another star won’t be here within the decade, or even within several, but neither are those technologies mere magical realism — indeed, planning for their development has begun in earnest. In September of last year DARPA, the Defense Advanced Research Projects Agency, convened a conference in Orlando, Florida, to discuss and promote one of its newest and most intriguing research projects: The 100 Year Starship Study. According to DARPA, the study is intended to “develop and mature a technology portfolio that will enable long-distance manned space flight a century from now.” To that end, DARPA is now negotiating a grant of $500,000 to ex-astronaut Dr. Mae Jemison, whose personal foundation will team up with Project Icarus, a division of Icarus Interstellar, to seed the plans for an interstellar mission that could span several centuries. Project Icarus, which will focus on the mission’s technological challenges, is a theoretical engineering study that was launched in 2009 by the British Interplanetary Society with the purpose of designing an interstellar spacecraft. It brings together an international group of volunteer aerospace engineers from government space agencies, universities and the private sector with the purpose of generating technical reports on the engineering layout, functionality, physics, operation, and mission profile of an interstellar probe. You can think of it as a kind of repository for bleeding-edge thinking about interstellar travel. 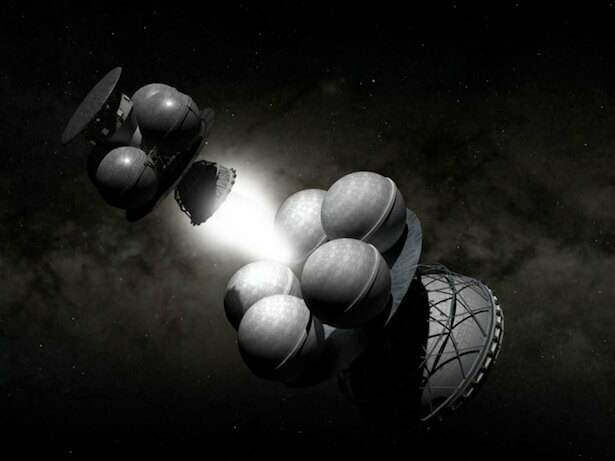 Project Icarus takes its inspiration from Project Daedalus, a five-year study launched by the British Interplanetary Society in 1973 to determine whether interstellar travel was feasible at all. Project Daedalus ultimately concluded that interstellar was possible, but acknowledged that the technical challenges were significant. Icarus aims to pick up where Daedalus left off, by trying to chip away at some of those technical challenges. Andreas Tziolas, a former research fellow at NASA who holds a Ph.D. in Gravitation and Cosmology, is the Project Leader for Project Icarus. Yesterday I spoke to Tziolas about how and, more interestingly, why we might someday send a mission to the stars. How did you first get interested in interstellar travel? And that’s what I’ve been doing these past 25 years. My first degree was in spacecraft engineering, after which I worked on several space missions for NASA. I worked on the Hubble Space Telescope, the Galileo Mission to Jupiter; I worked on the Mars Pathfinder, and on the Mars Polar Lander. And after a pretty intense period of involvement, I realized that from an employment perspective, these projects were kind of tenuous. When you work on a space mission, especially a planetary explorer, you’re generally out of a job once you make it to launch. Maybe two or three people out of the twenty working on the mission will stay on as support staff, with the rest looking for work elsewhere. So it’s not the best way to pursue a career. At the time I was interested in more analytical and computational physics, so I went back and did a Ph.D. in Cosmology at Baylor University. In doing this, I was trying to balance my capabilities, both the theoretical and technical capabilities, and I think it worked, I think it gave me an advantage. When Project Icarus was first started, one of the main reasons we thought it was important was that people the original Daedalus team, and several of the very important researchers in the field of interstellar engineering had been slowly passing away, or else retiring. Suddenly you had this situation where there wasn’t a new generation of interstellar engineers on the market. There was no one working on this. When we started up, one of our first objectives was to raise up this new generation of interstellar engineers — we wanted volunteers, anyone, whether they are Ph.D.’s or garage inventors, or just people who are passionate, people who spend every evening reading about interstellar exploration. There are several people around the world who have extraordinary technical expertise, but don’t necessarily look good on paper, and so they don’t have an opportunity to contribute to NASA or ESA or any of the other major space agencies. And so where do those people go? They end up working in I.T. or they end up working as clerks, but in their hearts they have this burning fire to do research. So what we do is corral all of those people with that fire and we organize them, and we organize the research in a detailed way, so that we can harness the power of inclusiveness in doing this kind of research. Because remember what Daedalus was trying to achieve was just a feasibility study, a study to see if this was even possible. And the Daedalus reports are very underappreciated. This was the first time in human history that some team proved that interstellar exploration is feasible using the physics of today. That had never been done before by NASA or anyone else. It was a significant milestone. So that’s why we chose “Icarus,” but besides that we have a clever way of seeing the Icarus myth, which brushes away some of the inhibitions people have. Because we hear it a lot, that we picked the wrong name, that “hey isn’t this the guy who tried to fly with his father’s wax wings and fell into the ocean.” But that was a myth, a myth from 2,500 years ago, and like many myths it’s flexible, especially in a time like ours when we have Hollywood and CGI, which are tools that allow you to reshape a myth. In our version, Icarus falling into the ocean wasn’t the final chapter. We believe that he washed up on a beautiful deserted island, and he looked for his father in the sky and didn’t see him. So he started a fire on the beach, and tried to think about how he might get back to the sky. And at that moment he looked toward the sky and he saw his destiny, and his destiny was to forge new wings of steel and fire so that he could try again. And he wouldn’t repeat the mistakes of his father, who after all had fashioned the original wax wings. He would improve on his father’s design. A lot of reasons have been offered for why this project, this general project of going to the stars, is important for humanity. Some have said that in the long term the project is necessary as a means of “backing up the biosphere,” that we need to find another planet in order to ensure that humans survive future extinction events on earth. Others point to the potential for scientific knowledge, especially in the areas of cosmology or astrobiology. And then there’s the idea that deep space is a kind of proving ground for humanity, that it provides the ultimate test of our intellectual and creative capacities. In your eyes, what is the most compelling reason we ought to pursue this? Tziolas: This could be a very long conversation. At Project Icarus we keep adding new reasons and new motivations for going interstellar, as we call it. First is obviously the survival of humankind. If humanity is capable of achieving interstellar flight but does not pursue it, does not pursue a program of seeding other planets and other solar systems, then really we risk receiving a Darwin Award as a civilization. If you can save yourself, but you don’t, for whatever reason — how can you justify that? When you’re working on a sensitive document on your computer, the first thing you do is back it up. You make a copy of it, you email it to yourself, you put it in your dropbox, and your flash drive — sometimes all these things at once. Why do we pay this obsessive attention to backing up a document, which we can reproduce, when we pay no attention to backing up our civilization? There is no greater endeavor than ensuring the survival of humankind. You also want to push technological boundaries. If you don’t have one of these huge problems to solve, that’s hard, really hard, then you won’t motivate yourself to solve it. If the human population had never risen past one billion people, everyone would live very comfortably, spread out, there might not be high rises, transportation would be different — the whole civilization would be different. The unique problems that come with high populations have given rise to these technologies, to these ways of living. Similarly, had we never decided to go into space, our civilization would be very different. We wouldn’t have cell phones, we wouldn’t have satellite systems, and we wouldn’t have this type of computational power. We would have been fine, but we would be stuck at a certain level of technological advancement. In order to achieve interstellar flight, you would have to develop very clean and renewable energy technologies, because for the crew, the ecosystem that you launch with is the ecosystem you’re going to have for at least a hundred years. With our current projections, we can’t get this kind of journey under a hundred years. So in developing the technologies that enable interstellar flight, you could serendipitously develop the technologies that could help clean up the earth, and power it with cheap energy. If you look toward the year 2100, and assume that the 100 Year Starship Study has been prolific, and that Project Icarus has been prolific, at a minimum we’d have break-even fusion, which would give us abundant clean energy for millennia. No more fossil fuels. We’d also have developed nanotechnology to the point where any type of technology that you have right now, anything technology-based, will be able to function the same way it does now, but it won’t have any kind of footprint, it will only be a square centimeter in size. Some people have characterized that as “nano-magic,” because everything around you will appear magical. You wouldn’t be able to see the structures doing it, but there would be light coming out of the walls, screens that are suspended that you can move around any surface, sensors everywhere — everything would be extremely efficient. Project Daedalus favored a nuclear fusion pulse engine, in which small pellets of fusion fuel would be injected at high velocity into a reaction chamber and ignited by high-energy electron beams. Is that still the favored propulsion technology? Tziolas: Project Icarus is focused on a fusion-based propulsion system, but the flavor of fusion is still up for debate. One of the problems with the Daedalus fusion propulsion system is that it runs on Helium3 and Helium3 is very scarce on the surface of the earth. In fact, in order to collect enough Helium3 to visit another star, you’d need to mine the atmospheres of the gas giants like Neptune and Jupiter. So our current thinking is that this is probably not the best way to go to another star if it requires that we mine half of the solar system just to get enough fuel. So, we’re trying to present a new fuel source or a new type of fusion, of which there are several. There are also other alternatives, such as beam propulsion, which uses a ground station or an orbital station that focuses energy from the sun into a beam, a stream of particles or radiation, in order to push a spacecraft to the other star. The physics and engineering of this are both well understood. We know how light reflects off of surfaces and we have experience with solar panels, so we don’t have the same disconnect that we have with fusion. Because remember we haven’t actually achieved fusion, sustained fusion, in the laboratory. But the major problem is that the beam that you transmit is going to diverge to a certain degree, and as a result you are going to lose some thrust. The other obstacle is the sail you’d need to capture the beam; to complete a mission like the one we’re talking about you’d need a sail that was roughly a hundred square kilometers in area, and that isn’t feasible right now. The third option is nuclear fission, which Project Orion intends to use, and there you have small-scale nuclear warheads — although we don’t call them that, we use something more diplomatic like “fission pulse units” — and you detonate them behind the spacecraft to push it through space. Freeman Dyson has been an advocate of this approach. Obviously there would be enormous challenges involved in communicating with a starship at such great distances. What is the latest thinking on how that might be accomplished? Tziolas: Yes that’s a major concern. If you can’t communicate with the ship then you don’t know what the results are of your mission. It’s an active area of research, and we’re considering several alternatives. One idea is to moderate the fusion pulses in the main engine, and using it to encode signals — but that’s a worst case scenario. We’re also considering point-to-point laser communications, but the challenge there is the power drain would be enormous. It would probably require a second fusion reactor, and that’s fine but you have to design that in. Another, more interesting option is the use of relays, and this was explored in the previous phase of our research at Project Daedalus. The idea is that when you drop the empty fuel tanks along the way, you design them so that they can double as relay stations. You could power them with small reactors, and use them to relay signals back to earth. We have two studies on this, and one says this could work and the other says it can’t, so we’re working on it. What are the main considerations involved in choosing a destination star? Tziolas: Well we’re somewhat limited by the timescale we’ve chosen. We want this to be a hundred year mission, and that puts our maximum range at fifteen light years, using the best estimates about fusion technology. Right now we’re designing around Alpha Centauri because it’s the easiest, and because it’s a double star we expect it to be very interesting scientifically. However, if a terrestrial planet is discovered and it has a few oceans and it’s within 22 light years instead of our maximum of 15, we would button down and make that our mission. Habitability is the prime consideration. Interesting. I’m surprised it’s that and not extraterrestrial life, but then I suppose they overlap. Tziolas: If there were two planets: one of them is teeming with life, but it’s not habitable because it’s methane or sulfur based life, and the other is an Eden with an oxygen-nitrogen atmosphere and only eighty percent our gravity, so everyone would be a superman, and they’re in opposite directions, where would we go if you had to pick one? To us, proliferating the human race must always come first. We would go to the Eden and not think twice about it. Do you expect that the current exoplanet fever — sparked by, among other things, the recent data from the Kepler Space Telescope — will lead to more attention and investment in interstellar travel? Are there any other developments, be they cultural or technological, that could give momentum to a serious public desire for a mission to the stars? Tziolas: The investment in exoplanet research is not going to end any time soon. It’s something you can keep on doing for a very long time, and it’s a nest that astrophysicists will be able to build and nurture, with advances in capabilities on the scale of the great particle colliders on the Earth. You can always go to higher power, you can always go to higher magnification, you can try interferometric methods, better angular resolution, more spacecraft, the James Webb Space Telescope, the list goes on. So once we find this Eden, this beautiful place that is in our solar neighborhood, people are going to want to go there. There will be a push for an interstellar mission and it’s our hope that Project Icarus is in a position to deliver when that happens. In the meantime we are trying to raise the profile of interstellar travel. It’s something I often think about because I’m in charge of education and outreach for the project. One thing we’re doing is adding courses in interstellar engineering to aerospace programs in the United States and in Europe. We expect the first of those to begin this Fall. But more interestingly, we’re also opening a new gaming division. For a while we’d pictured these as educational games, but when we got to the 100 Year Starship conference, the feedback we got was: “It doesn’t have to be that educational — just make some spaceships that reflect your designs and let people fly around and explore Alpha Centauri.” And so we came back the next week and we started looking into that, and now we’re designing these games that we can use to attract people to the concept of exploring another star. This is something that is a constant focus for us, because while it’s certainly true that a mission of this kind needs a dedicated engineering program, it also needs mindshare. We need people to believe that interstellar travel is a reality, and we need them to adopt it as the next great space exploration effort that humankind is going to undertake. And to do that we’re going to need a cultural shift in the way that we think about space, and the way we think about the universe. Have you and your colleagues given any thought to including something like the Golden Record that was stowed away on the two Voyager probes, the disc of sounds and images from Earth compiled by Carl Sagan? Tziolas: We have, actually. It only took a week after the project began for people to start putting together a new record, and to start thinking about what the content of the record would be, but we haven’t really agreed on what the message would be. After the core design team had the initial discussion, we decided that the message should not be designed by physicists and engineers but rather by a sociologist or an anthropologist, but that was the limit to what we agreed on. We all agreed that what Carl Sagan sent was great; we just need to adapt it to our own time. Since then we’ve been actively trying to recruit anthropologists and sociologists to the team. One of my concerns is that if we send another golden disc, it might not be well suited to reaching its audience. The chances of an extraterrestrial finding it and reading it are worse than a needle in a haystack; it’s like a particle in a universe. So my preference is to design some kind of module that was more technological than the analog disc, that way you could send it in to orbit around your target star, equip it with solar panels, have it charge up and once every twelve hours or so it gives out a pulse. And that would be just to give this other civilization something to look at, and when they design the capabilities to go check it out, they would, and then inside there would be something static, something like the golden record.